The Forum is a continuing series of meetings bringing together stakeholders in the Hampton Roads region to discuss solutions and best practices for adapting to sea level rise and increased flooding. This project is a collaboration among Virginia Sea Grant, Old Dominion University and the Hampton Roads Planning District Commission. This time, the Forum had the theme "Comparing Flooding and Sea Level Rise Risk Assessment Tools." 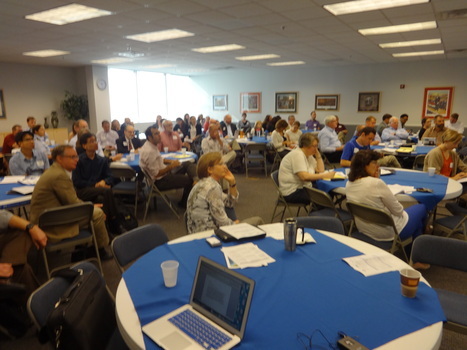 It was attended by over 70 people from government, business and academia. Participants were able to compare impact analysis tools that varied from a national focus on awareness to site specific building preparedness. A Mapping Tool handout was distributed. 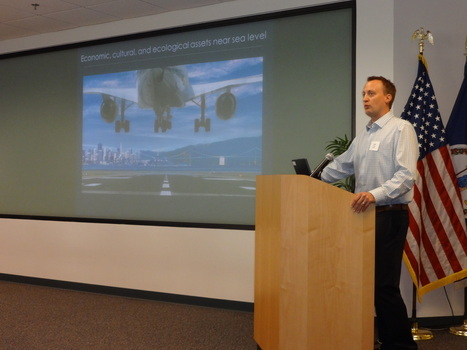 Adam Parris, NOAA, discussed the 2013 U.S. National Climate Assessment. Over 70 participants from government, business and academia attended the Forum. For more information please contact Michelle Covi, mcovi at odu.edu.